Gennusa's favorite subject has to be longhorns - especially pintos. Their markings are remarkable and each is unique. 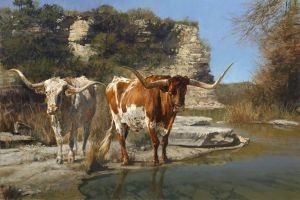 The title is a double entendre as the creek in the painting is Pinto Creek. These two are prime specimens of this Texas favorite. Perhaps Gennusa's years as a Texas Longhorn might possibly influence him.